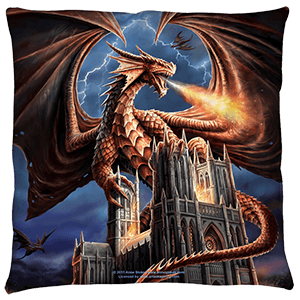 Dragons are classic medieval beasts, and as a provider of great medieval merchandise, we offer you the widest selection of dragon statues possible. 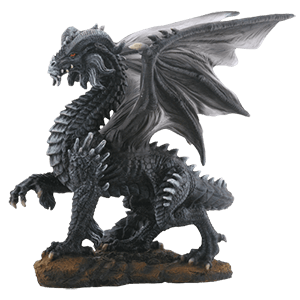 Here in our dragon statues section, you will find a huge assortment of dragon statues, figures, and sculptures, so much so that virtually anyone could find the dragon of their dreams here. 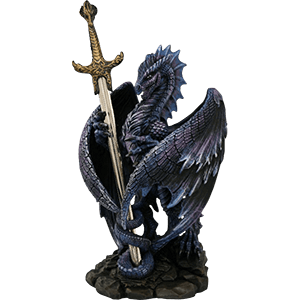 Shop here for hand painted dragon statues, detailed dragon figures, and impressive dragon sculptures. Some would even say that our assortment of dragon statues is somewhere near staggering. Given that dragons can be quite varied in appearance, so too are our dragon statues. 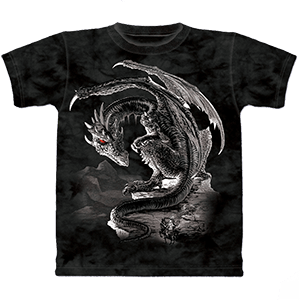 They come in a variety of colors, ranging from green and black to red, silver, blue, and other impressive colors that render a dragon impressive and eye-catching. We offer dragon statues in a variety of poses as well. 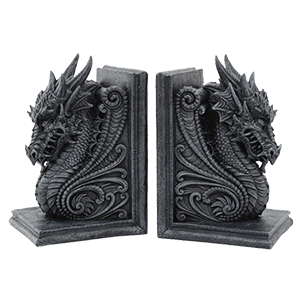 Attacking dragon statues are a great choice for a more aggressive decorating scheme, while peaceful, resting dragon statues are elegant options. 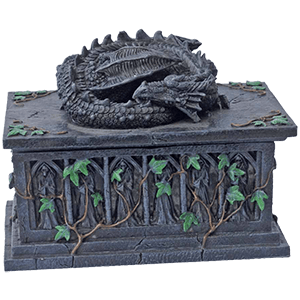 Protective dragon statues that look after their treasure look great around other valuables or around other statues, allowing for unique little medieval and fantasy scenes to be created throughout your decor. 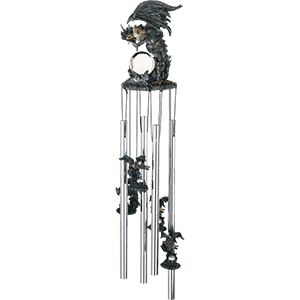 The one thing our dragon statues and dragon figurines all have in common, though, is their level of detail, as all of them feature an impressive look that has a great level of intricacy, making each one a great decoration on its own. These dragon sculptures are a perfect choice to use in your own home decorating, whether you are adding them to a medieval table, a typical bookshelf, or including them in your own collection of dragon figurines. Enthusiasts of all ages will enjoy the dragon statues found here as well, making them great gifts for special events and holidays, like birthdays and Christmas. Have you ever shaken a dragon? It sounds like it would be quite the mistake to make, and yet, when it comes to these dragon globes, it is not. In fact, these fantasy dragon water globes are meant to be shaken! 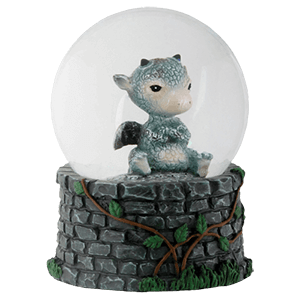 Our dragon snow globes all possess an impressive level of detail that renders each one a great display item to include in your decor. The styles of our dragon water globes can vary from one to the other, as some feature dragons contained within the globe while others depict dragons outside the globe and gazing within, either admiring what is inside or gloating over somehow trapping the occupants of the globe. 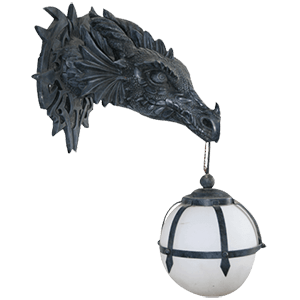 Given the association of dragons with medieval fantasy, many of our dragon globes also feature things like castle, treasure, and even wizards! So the next time you get the urge to add a new dragon decoration to your home decor, why not make it one of our dragon globes? Not only are they great to look at, but they are also somewhat interactive. Plus, how often can you say that you get the chance to shake a dragon up daily? One would almost expect a dragon to smell of smoke and brimstone, but that is just not the case. At least, not with these dragon incense burners! 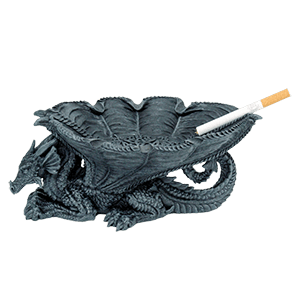 Instead, these dragons are ideal vessels to help you enjoy your favorite incense scent. Being creatures of fire and smoke, these dragons are happy to burn incense for you and do not mind catching the ashes either, so long as they are put to regular use so that they get to enjoy the smell of your favorite incense as well. Our medieval dragon incense burners come in a variety of shapes and sizes, ranging from typical tray-style incense burners to more unique designs that are perfect for enjoying a good stick or cone of your favorite scent. 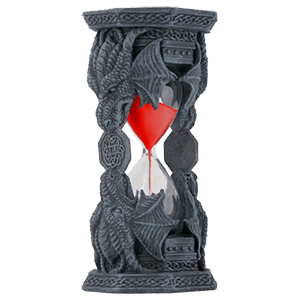 Our variety of incense burners all have one thing in common: they are impressively detailed and sure to add a dose of fantasy style to any decor. 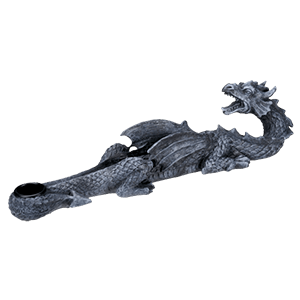 The dragon incense burners here are not only highly detailed tools for enjoying our favorite scents, but they are also budget friendly, which means that they are great personal acquisitions as well as great gifts to give others. We pride ourselves on offering some of the most helpful dragons on the market. Here in our letter openers section, you will find a number of useful little dragons, all of which are ready to offer up their sword for your personal use, either as a letter opener, a pick, or simply as a little decoration to admire on your desk. Of course, these little dragons are by no means your typical letter opener. 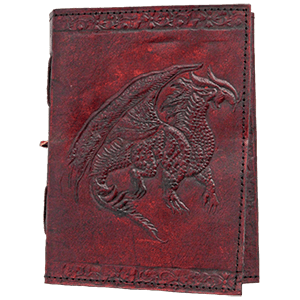 Each one features incredible detail in its construction, making our dragon holders impressive display pieces that you will definitely want to show off. Our dragon letter openers come in a variety of different styles, ranging from medieval dragons that carry shields or wear armor to fantasy dragons that have been hand painted to look like ancient stone. Some are typical European dragons, being great winged beasts that stand on their hind legs, while others are fearsome winged serpents that encircle their blade like a guardian. A dragon letter opener makes for a great decoration to include in your office or desk decor, either at home or at work. No need to put dragon style away come the holiday season. Instead, add to it with our marvelous selection of dragon ornaments! 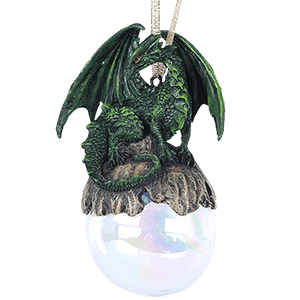 Perfect for hanging up anywhere, but particularly suited for Christmas trees, our dragon ornaments will lend a magical touch to the festive season. 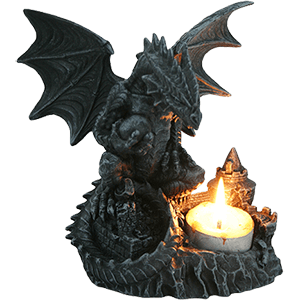 Shop here for mini dragon statue ornaments, dragon globe ornaments, wooden dragon ornaments, and more. All these dragon ornaments make fine additions to holiday decor as well as unique, eye-catching pieces when placed within existing fantasy displays. 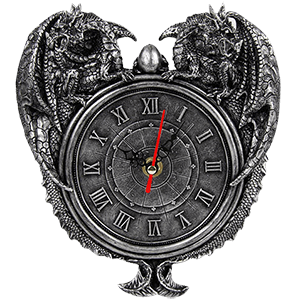 If your wintertime surroundings could use a touch more of fantasy holiday style, be sure to take a look at all our dragon ornament options here.